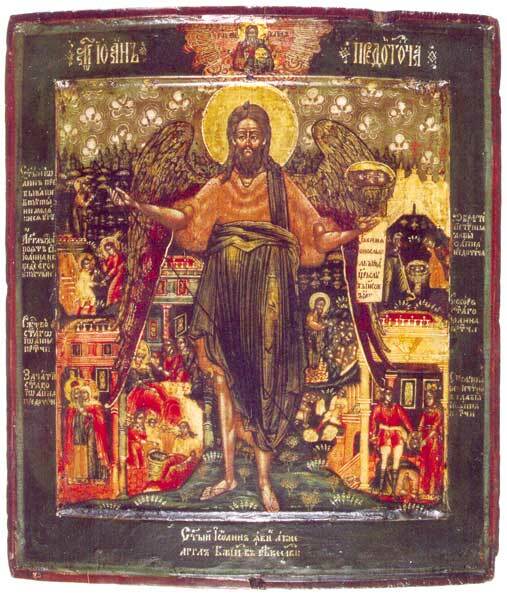 Known in Western Christianity as John the Baptist, he is commonly called John the Forerunner in Eastern Orthodoxy. In the New Testament he was the forerunner of Christ’s earthly ministry, and in the apocryphal Gospel of Nicodemus, he was also the precursor of Christ’s descent into Hades. In this example, he is seen as an “Angel of the Wilderness,” depicted with wings and wearing a hair shirt. The wings derive from the double meaning of the Greek word used to describe him in Mark 1:2, “As it is written in Isaiah, the prophet, behold I send thy angelos (meaning both messenger and angel) before thy face, who shall prepare the way before thee.” John holds a staff in his right hand and in his left hand he holds a salver containing his head and a scroll which begins, “At that time Herod, the tetrarch, heard of the fame of Jesus…” […and he said to his servants, this is John the Baptist…] (Matthew 14:1). He is surrounded with related scenes. Clockwise from the lower left corner as inscribed on the border is the ZACHATIE SVYATAGO IOANN PREDTECHA: “The Conception Holy John the Forerunner.” Next is the “Birth of John,” followed by “An Angel Taking the Child John into the Wilderness,” there to remain until he comes of age. Continuing we see “The Assembly of Holy John the Forerunner” (the crowds assemble at the Jordan for baptism), “The Beheading of John the Forerunner” and the “Finding of the Honorable Head of John the Forerunner,” in this case the third of three such discoveries. The overall style and pallet would suggest a Yaralslavl or Armory School trained artist. Here again in this icon the main figure of John, in particular his face, is rendered in a more natural way or realistic manner.